Cirris provides Performance Check Kits to ensure your tester is calibrated correctly. Confirm and verify that your tester is operating to published, specified standards. Determine possible tester malfunctions. Performance Verification Check Kits can save your company time and money by bringing 'in-house' the ability to verify that your Cirris tester is working within its published specifications. In just a few minutes you can certify that your Cirris test system is in compliance with the manufacturer's standards. In addition to the information presented below, see Frequently Asked Questions about Performance Check Kits. All kits verify the proper operation of the signal routing system by scanning all test points on the tester. Each tester model generates a unique code as part of this test which must conform to a known standard. This verification process insures that all points function as expected. The zero Ohm test adapter is the standard used for the 'Signal Routing System' test. 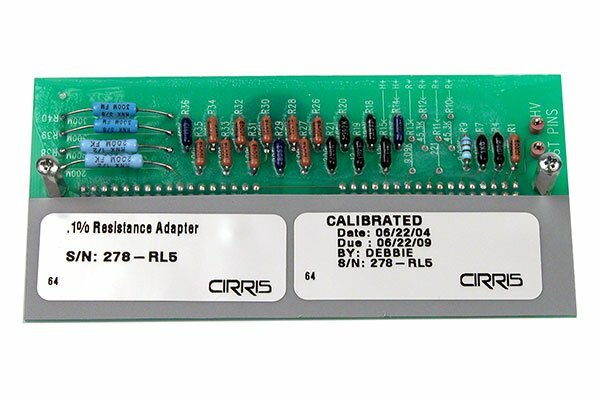 The 'Resistor Leak' adapter is the test standard used for this type of verification. Note: This process cannot be described as a "calibration" process, (because you cannot 'dial in' or 'tweak' a setting to make a correction to a unit.) This process should be thought of as a process to verify that each test point is functioning and is operating as designed. Tester models which have the capacity to measure resistance values during the normal test cycle must have the "resistance measuring system" verified by comparing resistances found at selected points in the tester against the known resistance values of the 'Resistive Test Standard'. In a similar manner, testers with other testing capabilities; IE: Capacitance measuring, 4 wire Kelvin measurements, diode presence and bias etc., each have their capabilities tested when the proper test adapter is used to verify that capability. Using a high impedance voltmeter (or a standard voltmeter with a High Voltage Probe attached) the verification kits designed for hipot testers will measure and verify output voltages of the 'high voltage supply'. This process verifies that the hipot test voltages selected by the user during a high voltage test are at the voltage level selected. Again, this verification process cannot be called a calibration process because there are no adjustments that you can make to bring testers into 'compliance'. If the tester fails any verification test, the tester must be returned to Cirris Systems for repair. The step-by-step manual walks the user through each phase of the verification process and provides blank documentation sheets for recording parametric test data. The test standards are certified gauges with traceability to the N.I.S.T. When used in accordance with the verification procedures outlined in the manual, traceability can be transferred to your Cirris cable tester. Note: The type and number of test standards in each kit vary depending on the capabilities of each model. Each kit contains a Certificate of Calibration that provides traceability to the N.I.S.T. The 'standards' are calibrated and certified for a service period of two years, after which they must be replaced. When Cirris first introduced Performance Check Kits, ISO-9000 and other quality systems did not exist. As more customers implemented quality systems, the 5-year service period of PCHK's became problematic. If a kit fails final certification it can render invalid all testing performed on testers verified with the kit since its last certification. We felt that a two year period would better serve our customer's needs.